Posted on 17, June 2016 by EuropaWire PR Editors | This entry was posted in Banks, Infrastructure & Utilities, Norway and tagged Bergen, loan, NIB, Norway, wastewater. Bookmark the permalink. Bergen, Norway, 17-Jun-2016 — /EuropaWire/ — NIB has signed a 20-year loan programme with the City of Bergen, Norway, to improve its wastewater-, and possibly, drinking water infrastructure. 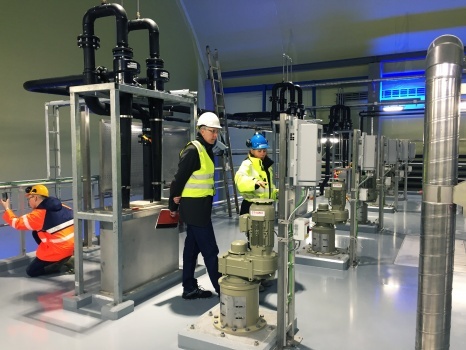 The loan programme consists of two tranches, of which a NOK 1,000 million loan has been provided to finance an upgrade of the wastewater treatment system in Bergen, with an option to later agree on a NOK 500 million tranche to improve quality and distribution of the city’s drinking water. The first tranche will finance three of Bergen’s four wastewater treatment facilities located in caverns at Holen, Kvernevik and Flesland. The first two became operational in 2015, and Flesland will be commissioned in 2016. The new plants will increase the treatment capacity to accommodate a growing population. The city’s upgraded wastewater collection system will also help separate storm water from sewage and thus decrease the risk of overflows during periods of heavy rain. The first loan tranche will also help finance the city’s biogas facility at the Rådal waste incinerator facility. The biogas investment will improve the efficiency of the region’s wastewater treatment and provide local renewable fuel options for, for instance, public transportation. The predicted amount of biogas to be generated at full capacity is 22.8 GWh annually. That would be enough to fuel up to 80 public buses annually. Bergen is Norway’s second largest city, with a population of around 278,000. The local economy is prosperous and fairly diversified. The main sectors are oil and gas, the maritime industry, fishing and seafood. Tourism has emerged as an industry in recent years, with about 500,000 visitors and 350 cruise ships annually.